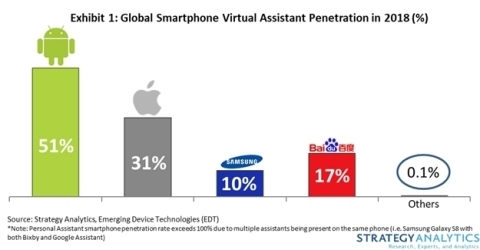 Google leads but Baidu Duer is surging and will overtake Apple within a few years. BOSTON--(BUSINESS WIRE)--Strategy Analytics in a newly published report from the Emerging Device Technologies (EDT) service, Smartphones: Global Artificial Intelligence Technologies Forecast: 2010 to 2023 concludes that in 2019 over half of smartphones globally will have virtual assistant and the share will grow up to 90% by 2023. The report Smartphones: Global Artificial Intelligence Technologies Forecast: 2010 to 2023 is available to Strategy Analytics clients of our Emerging Devices Technologies research service.